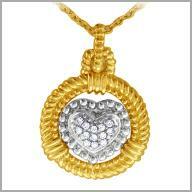 14kt TT gold open circle with a diamond heart pendant,0.1425ct of diamonds. A captivating style of beloved diamonds. Crafted with polished 14K TT gold, this pendant feature accents of white gold and come with an 18" yellow gold chain . 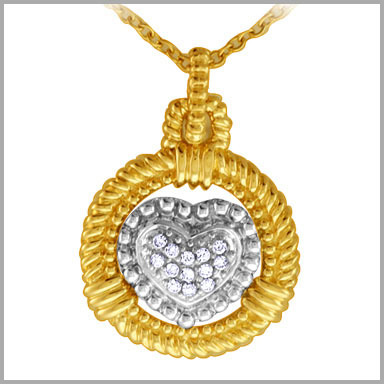 This open circle shaped pendant features a diamond heart with 13 round cut diamonds in bead settings, accented by a detailed edges.The total diamond weight is 0.1425 ct, with G-H in color and SI in clarity.It measure 1-1/8"x3/4".